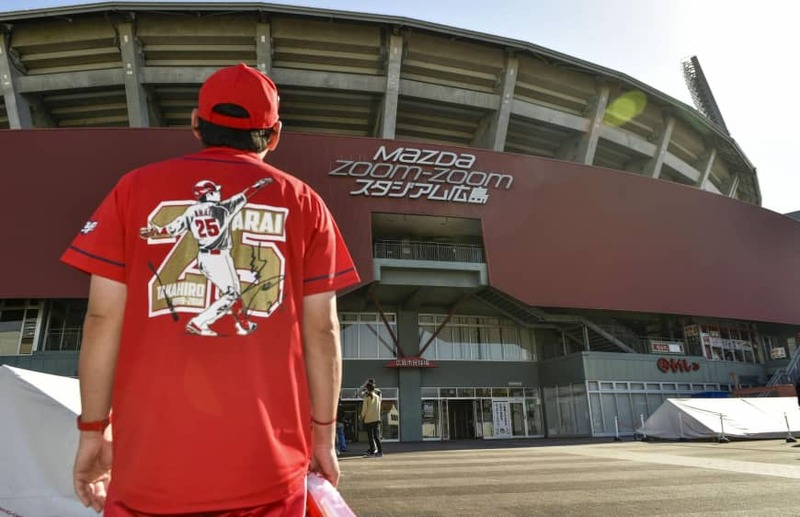 HIROSHIMA - Partly because it was Saturday, so many fans arrived at Mazda Stadium wearing red replica jerseys and T-shirts hours before Game 1 of the Japan Series between the Hiroshima Carp and Fukuoka SoftBank Hawks. Almost all of them were Carp fanatics, who are desperate to see their team win its first NPB championship in 34 years. Middle-aged fan Toru Ohashi, who arrived at the Carp’s home park with his wife, Akiko, was one of those can’t-wait fellas. Ohashi, a 56-year-old company employee, said with a bashful smile that they might have gotten there “a little too early,” but added that they could not stay home and do nothing. 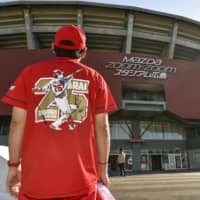 If not as enthusiastic a fan as his husband, Akiko believes that this year is the time for the Carp to end their Japan Series drought after the Central League team finished with disappointing results in the last two postseasons. In the 2016 Japan Series, the Carp had a 2-0 series lead before losing in six games to the Hokkaido Nippon Ham Fighters. Last year, they repeated as CL champs, but failed to reach the Japan Series, falling to the Yokohama BayStars in the Climax Series Final Stage. The Ohashis said that they remember the last Japan Series-winning season for Hiroshima in 1984, when it edged the Hankyu Braves (predecessor of the Orix Buffaloes) in seven games. But not all of the current Hiroshima fans and Carp supporters who attended Game 1 have retained the memories from 34 years ago. One young female fan, who requested anonymity, was one of them. She was born after the Carp’s last Japan Series title-winning season. She wore a vivid red Seiya Suzuki replica jersey and her friend donned one of Yoshihiro Maru, the reigning CL MVP and one of the leading candidates for this year’s MVP race. Both sluggers are in their late 20s. She has been a Carp Joshi (Carp female fanatic) over the last several years. She insisted that the city and prefecture have been energized during the Carp’s league three-peat run.